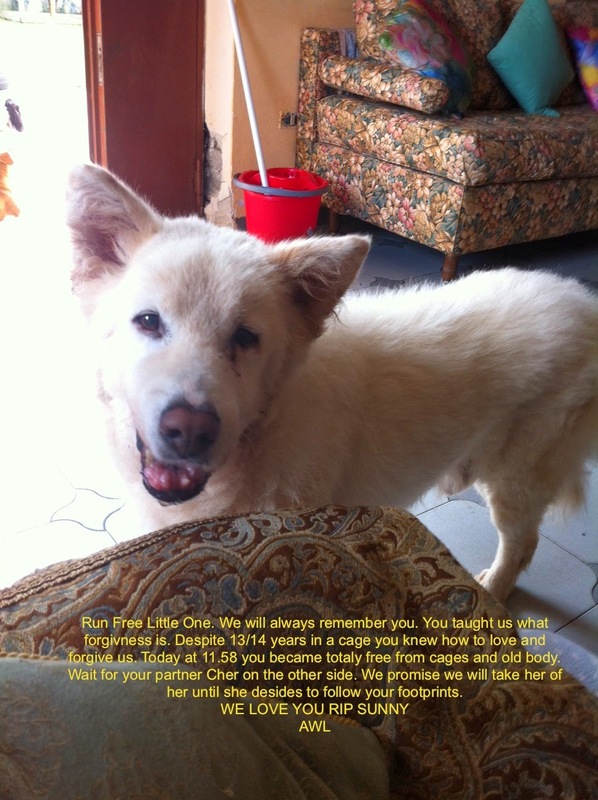 Sunny, with his white fluffy coat, who sat, together with his “partner” Cher for such a long time. Cher, a beautiful small, brown, fox look-alike, female. No one really knows how old they are, but some documents indicate the year when they arrived at their horrible shelter with 400 cages was 1999! At that shelter, there is no grass, only concrete. They don’t even get walks outside their pen. Nothing to do, but waiting for death to come and rescue them. Not many know about this shelter, it stands out in a open field away from people and houses. A small gravel road will take you there, one that gets smaller and narrower the further you go towards the shelter. Many cars wouldn’t make it. If you continue going on the small dirt road it gives you the impression that it will not lead you anywhere. Many American volunteers couldn’t handle watching all these gorgeous dogs being crammed in together in the cages when going with us. The smell is overpowering; the many diseases are obvious, as are the crippled dogs in need of veterinarian care. Their fur is so matted and laced with old feces tangled in. 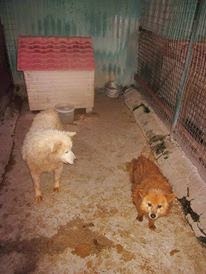 Sunny and Cheer’s document tell us they have been living in a 2 meter x 4 meter cage with a concrete floor for over 13 years. No one took them for walks and no chance at adoption. Incessant barking from the other prisoners likely numbed their minds. At least they were alone together, no other dogs to share their meager space. They were only two numbers on their cage door. Over the years, they seemed to grow content with their lot in life, and that they had each other. “All I ever need is you.” He was her “little” man. Animals Without Limits was asked if we could take them to our hospice, to provide a “home” feeling for their last months of life with healthy food, medicine and love. When we got them to our Hospice, at first they looked confused walking around and of course we gave them the time to survey their new home. It was obvious they had never seen a house, dog bowls, streets, cars, or radio. Or grass. Cher and Sunny were not afraid. Every time they saw one of our volunteers, they said “hello” with a wage of their tails. And as they had for so long in the shelter, they stayed together. Some people had said that it would be better to put them to sleep for good. That after all those years in a cage, they couldn’t be normal in their heads. These seniors are many times former cage animals, or abandoned Italian dogs that were kept, but not as pets. Sometimes, they were hunting dogs and had lived in small cages in the garden when not on the rare hunting trip — working. The volunteers adored them. Visitors loved them. 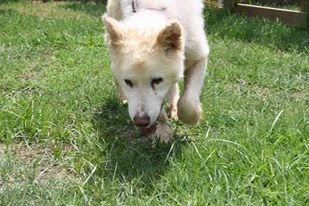 Far too soon, Sunny started to be ill. His back legs started to become weak. Even if we take care of Seniors routinely, it tears on your heart when they start to decline and become ill. You want to give them so much freedom and love to try to make up for suffering so long at other humans’ hands. Their gratitude is enormously painful. Their eyes are deep pools of love, saying thank you. You want them to forgive us for not rescuing them earlier. We want forgiveness for what other humans have done. As he declined, volunteers lifted him out into the garden and helped him so he could pee and poo. We worried about Cher, how would she cope after he was gone? 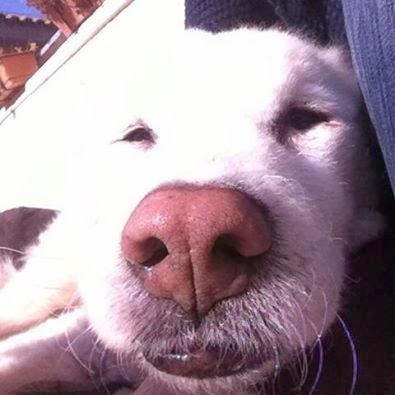 We decided that we needed our veterinarian to come to our hospice to help Sonny over to the other side. 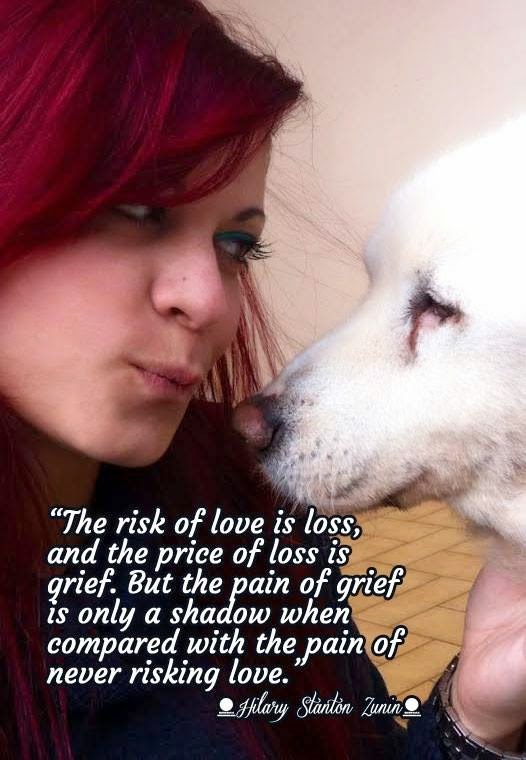 We felt that Cher could lie next to him when this would happen, his anchor of calm as he crossed the Rainbow Bridge. We had promised them that. With those last words Sunny let go and flew to the land of eternal freedom, where no cages or harmful people exist. Cher was right there as Sonny took his last breath. Dr. Vitorio and our volunteers all looked worriedly at Cher, but she seemed relived, happy for someone else’s journey. She seemed to know in her heart that she would soon be with him again. Until that time, she felt safe among friends. 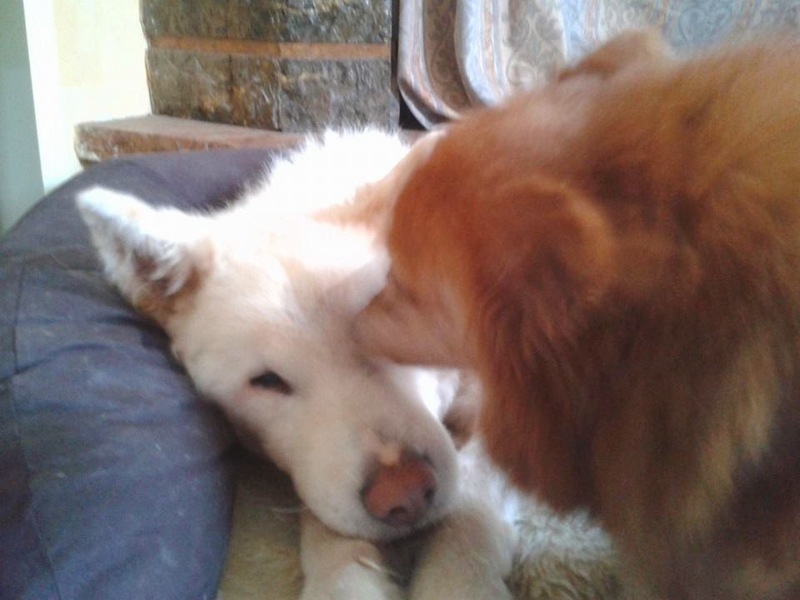 She walked inside the hospice and laid down in their bed, knowing her best friend was now safe. Sunny had died happy, and Cher was happy for his soul to be free at last. The beat goes on. Thank you great volunteers at the Hospice/ Thank you Sponsors, Anna Persson and Maria Hahne. Grazie!